This unique stitch reminds me of the Juliet Wall in Verona. 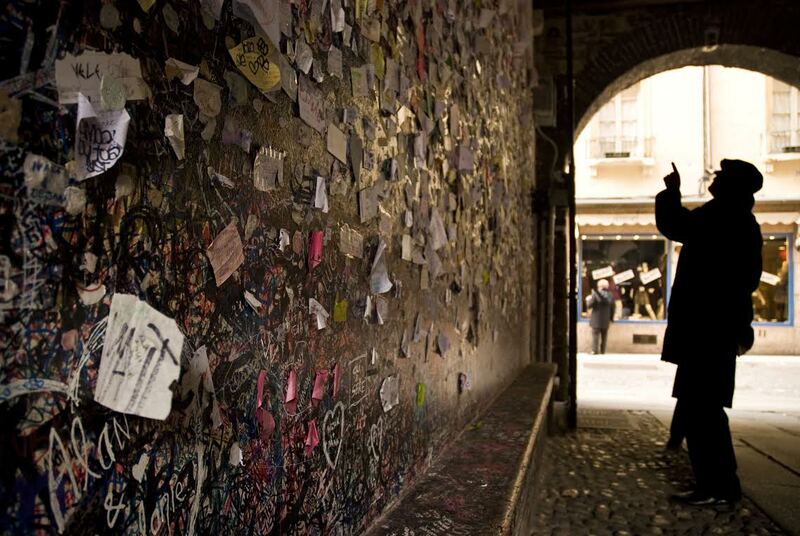 People travel from all over to place love letters in the little nooks and crannies of the wall. This extra special pattern includes letters to Mom from the four Figueira children. We each wrote a brief, but meaningful note to Mom. I’m not really a talker, so thought I’d write you a note. We’re all so grateful to have you as our mom. You have many qualities I admire, and wish I had more of myself. Bold – you weren’t afraid of new experiences – moved to CA as a young adult, traveled around the world (Israel, Mexico, Europe), Tupperware manager, parasailing, camel riding, roller coasters with the grandkids. Kind – Kaiser volunteer, wonderful grandmother, many friends at work – everyone benefited from your care and concern. Faith – you continued attending and serving at church even when others discouraged it; one of your closest friends was Father Brendan, who was there when you needed him most. You’ve been a great example of someone who put others above herself. I’m forever thankful you’re my mom. This is my thank you note to you. Thank you for introducing me to the Bobbsey Twins and a lifetime of reading, and later driving me all over town to buy used books with my paperboy money. Thank you for sharing your collection of 45 records, a musical history of the 1940s and ‘50s, and later coming to my school concerts. Thank you for being my 3rd grade Room Mother, my first teacher and my last teacher, for giving me patience and understanding, and helping me find joy everywhere. And thank you for my three sisters. When I called you on the phone and said, "Hi Mom," I always heard back, "Hi Diane." You told me that was so Dad knew who was calling, but I will always treasure those four simple words. If I could have one wish, it would be that you are aware of what has evolved because of you. Alice’s Embrace gives warmth, comfort, and joy to so many… just like you always did! I so hope you know how much my love for you has grown into my love for this endeavor. I look forward to the day that I can look into your pretty eyes and hold your soft hands and tell you that you were my first and forever love. Looking back on my life, I see you always there supporting me… sometimes literally, sometimes just in spirit. When my job took me out of town, you gladly helped with childcare ‑ you were a wonderful Grandma. When my life took turns that you may have questioned, you didn't lecture or push me ‑ you quietly showed your support for my ability to make my own decisions. I so appreciate the trust you showed me… just what I needed. I think that was one of your greatest strengths ‑ you recognized your four children as unique people with distinct personalities, and you knew how to be the very best mom for each of us individually. Thank you for being my mom! Click her for lap blanket pattern.